It’s finally Friday!! I am beyond happy for it to be weekend. I don’t have any particular reason except that it is weekend. I love weekends!! Onto the nails shall we. 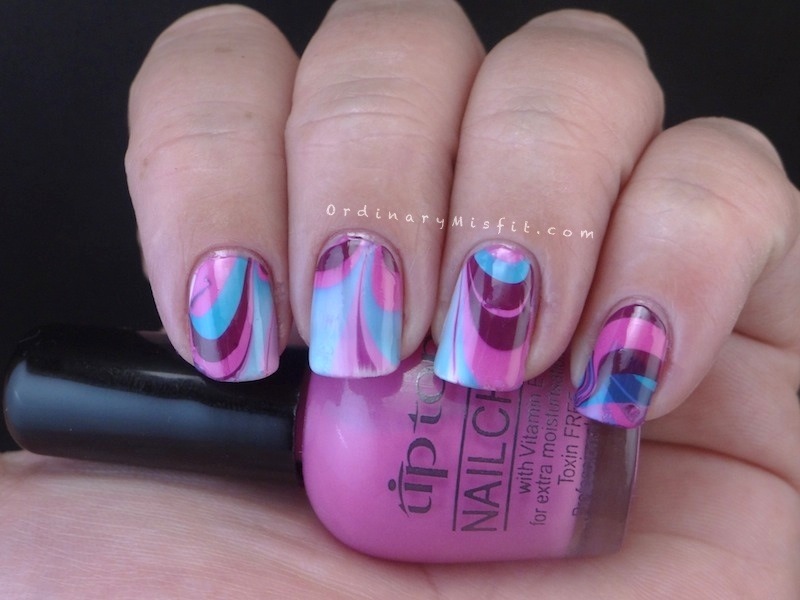 Because I am dreaming of warmer spring days I did a bright and cheery water marble. I used Tip Top – Sherbet Angel, Tip Top – Crushed Grapes and Tip Top – Blue Meets Green (I will show you the colours on their own later in the post) for this combination. I am still stumbling my way through the water marble gauntlet but I am actually really enjoying it. On my middle finger I had a funny thing happen near / on the tip. It came out of the water like that and I am not sure if I bumped it in the water or what happened. I also tried something else. My pinky came out very light and I decided I wanted to redo it. Then I thought ‘what would happen if I went over it instead of redoing it?’ Well, now you know. You can see on my pinky that there is some double marbling happening. I didn’t like it at first and then it grew on me a little. By the time I took it off I didn’t like it again. What do you think? What do you think of this combination? Let me know what colour combinations you think I should try next! I hope you have a fabulous weekend! I have something exciting I want to try and hopefully it will be a success of some sort and I can share it with you all. If you have any ideas or designs you would like to see me try let me know. These look gorgeous together! Wow! Loving the pink, purple and blue colour combo. Dude! I see now what V meant! This is freaking gorgeous! Love it! All the colors go beautifully together! LOVE! i vote NEON water marble!!! You know I’ll love that!! Thanks so much my friend!! You DO have loads of patience! Thank you Sweets!!! So glad you like it. You should definitely try it! Wow. 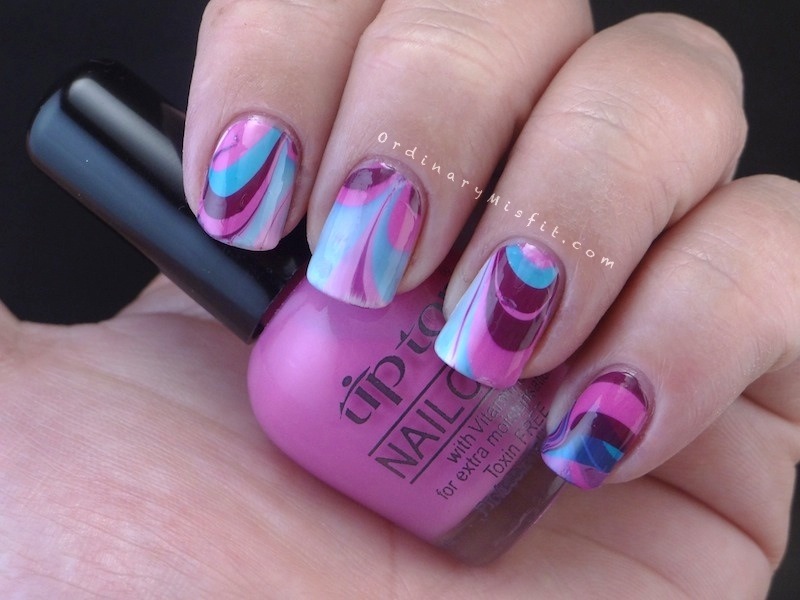 An entire water marble mani? You are ambitious! Hahahaha you know, until I read this I didn’t even think of only doing accent water marble. I love that!